Have you ever made a blooming 9 patch quilt? Cecile G. from our guild led us in a workshop last week with her pointers on making the blooming nine patch. I'm having second thoughts about my colors. I'm not sure what I was thinking!! Anyway before leaving for Cuba, I had all the larger squares and side setting triangles cut. Also, the binding done and 4 of the 7 sets of nine-patches are done. I plan to get the other 3 sets of 9-patches done the week after we arrive home from Cuba. Then it'll all get stored in a nice kit, and the assembly of these nine-patches and between squares and setting triangles will be a nice little project for me while we are away in South Carolina next month. Wash skein in mild soapy water. Rinse in clear water, twice. Hand squeese out water then lay on a towel. Fold the towel over and squeese more water out. Then hang to air dry. Well, I had these three skeins washed and hanging in my bathroom for a day before we left for Cuba. They were quite dry and I couldn't quite feel a difference in the texture, but maybe knitting with it will give more of a true test of the feel. I'll be knitting a Rococo Shawl this when we go to South Carolina next month, so I'll update you then. I'm getting great use out of my double passport holder that I made last summer. My little wallet was made from a free tutorial and every time I use it, I say to myself, "This was a useful little project! Besides my passport, I keep my boarding pass stubs, and my Air Canada Kiosk Cards in it. Well it's been a few months since we've traveled, so at the last minute we decided to take a little trip to Cuba. We've never been there before but many of my friends have, and we've got lots of advice to relax and enjoy the beautiful resort and beaches. We'll be back in a week. See you all then! Briggs & Little Wool Yarn - To Wash or not to Wash. There were a couple of suggestions on how to do it. Since I really want to make another Rococo Shawl, I decided I would try the pre-washing of the wool. I will use the suggestions of the ladies of course. It needs to be gently washed/agitated, while still in the skein. Then roll in a bath towel and squeeze so that the towel takes up most of the moisture. Then let skein hang over the end of a quilt rack, or ironing board until it's dried. I will be away for the whole week next week, so it will have a week to dry. I finished my Rocco Shawl today and have all the ends woven in. What got my needles clicking so fast to finish it, was that my friend, Donna C. gave me an unexpected gift yesterday!! It is a Shawl Pin. She bought at her local yarn boutique in Bathurst, NB and I love it. It's dark brown and I will have to research ways on how to wear my shawl and pin it closed so that it shows off the pin. It's hard to see in this picture, but look closely, you'll find it. Many thanks Donna for the pin. Your timing was perfect. And also thanks to my niece Stephanie for the gift of the pattern. It's been so fun to get back into knitting in the past few weeks..... Now I'm thinking... what will I knit next!! 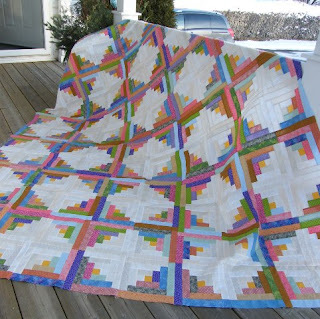 I am pleased to present St. Dunstan's Log Cabin Raffle quilt for 2012. I was so glad to have a guild meeting today, because that was all the motivtion I need to help me get it done a bit early. I will deliver this and the prepared binding to the ladies of the St. Dunstan's Quilters group on Thursday. Our first big snowstorm of the season has started yesterday afternoon. A snow day is a great day to get lots of sewing work done. One of the things I did was to lay out the log cabin blocks for St. Dunstan's quilt on the living room floor. It's going to be a large queen size. 10 blocks across by 12 down which will make this about 85" x 100". I like the layout..
Then it goes to the St. Dunstan's Quilters for marking and hand quilting. We're all on a knitting kick!! All 5 of my grand-daughters are knitting!!! Isn't that heaven. When Jessica and Emily were here over the Christmas Holidays, we knit!! Jessica has been knitting since she's a child, but only knitting really good for the last year or two. Recently, she caught the "Big Needle" craze... and Loves how knitting with big needles produces such a fast and soft scarf. Emily just learned when she was here over the holiday. She's a quick learner and she's a fast knitter too. I am so impressed that she caught on so quickly. Caitlin (in the pink) has been knitting for some time, and we just taught Grace (in the blue) to knit last night. She said.."This is kind of cool!". So we decided to let Aurora (in the middle) try to knit. She's got a ways to go, but she seems to have the knitting bug too. We'll let her think that she's knitting with all the big girls for the time being.. Here's my problem. I've run out of needles. I need a variety of knitting needles to cover all my kiddos knitting needs. (and they each have a friend who might want to learn to knit). Before I go to the Walmart to buy needles...I know many of my local friends have a bundle of needles that they are looking for a new home for. I'd love to put your old knitting needles to good use... I need double pointed needles (for Caitlin) and regular needles. I'll take circulars too. You'll probably see me at guild next week. Just bring them along... I'll be ever so grateful. I think I first saw these Sally Terry hook feathers when I read about her classes at Maine Quilts 2011 last summer. I thought they were so nice, and didn't quite understand the hook. I googled her and found that she has a book and I saw her demonstrating her unique feathers in a video. I can't seem to find the video right now to share with you. Well, I think I forgot about these hook feathers until recently. They came to mind when I was deciding how I would quilt my half square triangle practice piece...... I did a little 2 minute sample and they were easier than I thought.... It took less than an hour to quilt up this runner. When I go to the USA next month, I'll see if I can find her book. These feathers are everything she says they are... quick, easy, and no backtracking. I'm dying to see all the feather formats that are in her book besides these ones. I put some of the blocks on the spare bed to see how the layout was going to look. First thing I thought was that maybe I've made this way too big. It's intended to be a queen size borderless quilt in that it's strictly blocks from edge to edge. With only 32 more blocks to sew together, I'll be moving into the layout phase soon. I enjoy that phase and usually have one of my little helpers to look for places I need to change blocks out. This is a closeup of one of the blocks. I've used a traditional gold for the center of each block and light cream/tan prints for the light logs. I like how they are all different and the texture it adds. It's my first time doing a log cabin quilt, but won't be the last. Love the Marti Michel techniques. Happy New Year everyone. A quiet icy but almost mild day in Freddy Beach. Couldn't do our healthy walk today because the Willie Rink is closed, and it's so icy out, I know I'd fall and break my neck. So today will be a knitting and sewing day. Progress on my St. Dunstan's Log Cabin is good. I have 42 of 120 blocks done. I'm loving Marti Michel's technique of pre-cutting all the logs. I know now that sewing 16 blocks takes me about two and a half hours. I can't sew for that long so I usually sit down to sew them in two sessions. I need to do 5 more sets of 16 and then all the blocks will be done. Then I'll need a day to do the layout and sew them together. My goal is to have the top it done by Monday, Jan 16th so that I can take to my guilds show and tell on the 16th and 17th. It looks like a quiet week ahead so I should meet my goal comfortably.